It’s October and that means one thing in sports. Football season heating up? Call me back in February. Rugby World Cup? America isn’t making it out of Group play, so who cares? MLB Playoffs? What’s a Chase Utley, some kind of dog with a glandular problem? No my friends, it is once again time for the best sport of them all, rally. 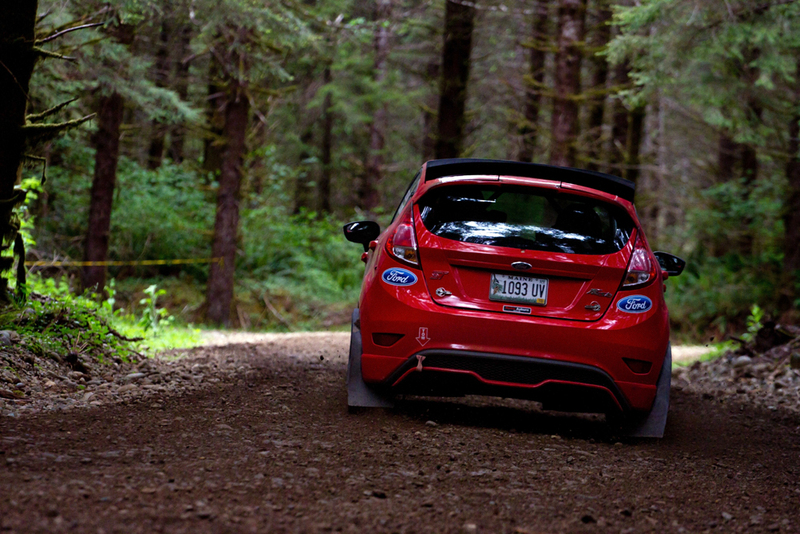 Specifically, the Lake Superior Performance Rally, the final Rally America National event of the year. And what a rally it is shaping up to be. With the class championships already decided teams will be fighting purely for a win to close out their seasons. But don’t expect LSPR to be a parade, a few one-off entries this weekend along with the possibility of thunderstorms should add just the right amount of unpredictability to the weekend. In short, you should follow LSPR because it is promising to be a blast! New to American rally? Eager to get an update on the drivers? Don’t worry, we’re here to make sure that you’re up to date on your Rally America knowledge before LSPR kicks off. Starting today with 2WD and B-Spec we’re breaking down each National driver/co-driver pair to give you a small idea of who they are and how they will perform this weekend at LSPR. There are even more great teams to talk about, so be sure to come back later today for the Super Production class. 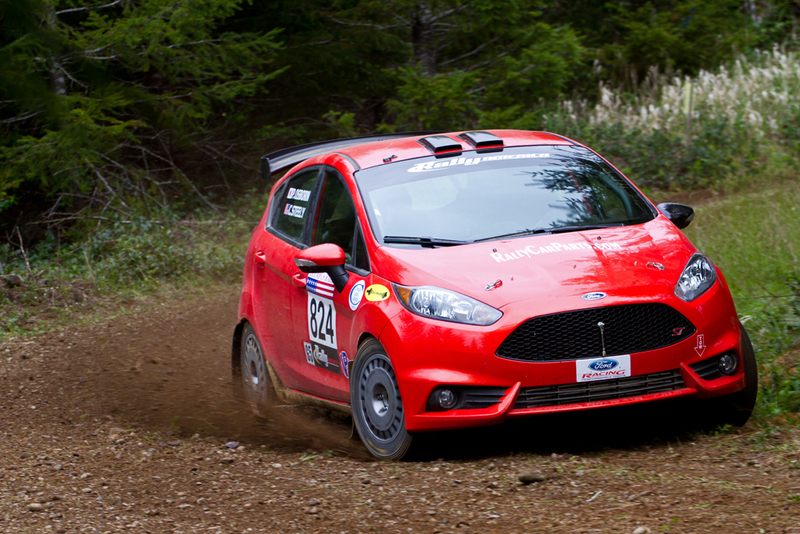 A great team fighting a new car this season, Cameron Steely and Preston Osborn have battled mechanical issues since introducing their Ford Fiesta ST at the Oregon Trail Rally this past April. The pair have posted as many finishes as DNFs in the new car, but their situation has been improving. A win at Ojibwe in August marked the first for the chassis, a much needed confidence boost for Steely and Osborn. The pair will be looking for a repeat performance to finish out the season and the odds are looking good. Teammate and closest rival Troy Miller is sitting LSPR out after securing the 2WD class championship and nobody else in 2WD has been able to match Steely and Osborn’s pace. However, the pair have yet to have a completely trouble-free rally. 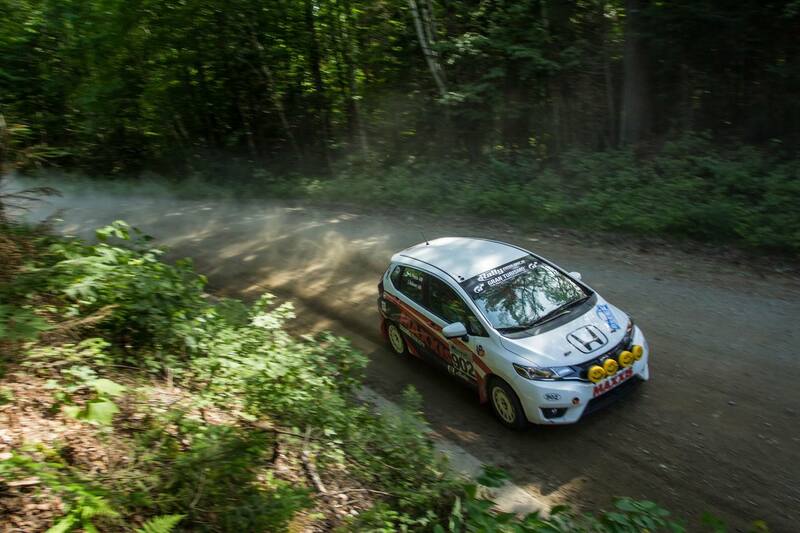 Turbo issues plagued the pair throughout Ojibwe’s second day, leaving the reliability of the car up for continued debate. Will their car behave is the main question this coming weekend. After transitioning to rally full time from desert racing, Steve LaRoza has struggled to find a competitive pace in stage rally. A pair of third place finishes early in the season showed that LaRoza is capable of a strong performance, but since then he has finished outside of the podium. Joining him at LSPR will be Martin Headland, Tracey Gardiner’s co-driver from earlier this season. LaRoza has made improvements in the latter half of the season, but with the improvements have come a mixed bag of luck. At NEFR LaRoza missed the podium by just over a minute, one of his strongest drives of the year. At the following rally, Ojibwe, he spent the latter half of the rally matching stage times with the B-Spec Honda Fit. At LSPR, LaRoza will need to find his NEFR pace again with a new co-driver. A tough proposition, but not an insurmountable one. The dynamic in the cabin will be everything. After a successful rally career in Japan, Futoshi Murase came to the United States in 2011. In 2013, he and successful regional co-driver Kieran Wright teamed up to run two events with mixed results. After parting ways for several years, the pair reunited for Ojibwe 2015. Between those rallies, Murase had not competed in a Rally America event while Wright co-drove in only a handful of regional rallies. Ojibwe made it clear that Murase and Wright could drive a clean rally, but it also showed that the pair had some cobwebs to dust off. The reunited team had trouble finding a competitive pace and spent most of the rally fighting for position with the B-Spec Honda Fit, but they had the occasional strong stage. How fast the pair can truly be will hopefully be seen this weekend. Tim O’Neill, yes that Tim O’Neill, is driving in a Rally America event for the first time since the 2013 100 Acre Wood Rally. The former Volkswagen and Mitsubishi factory driver is a five time rally champion and owner of the Team O’Neill Rally School in New Hampshire. In other words, O’Neill knows how to handle a car. 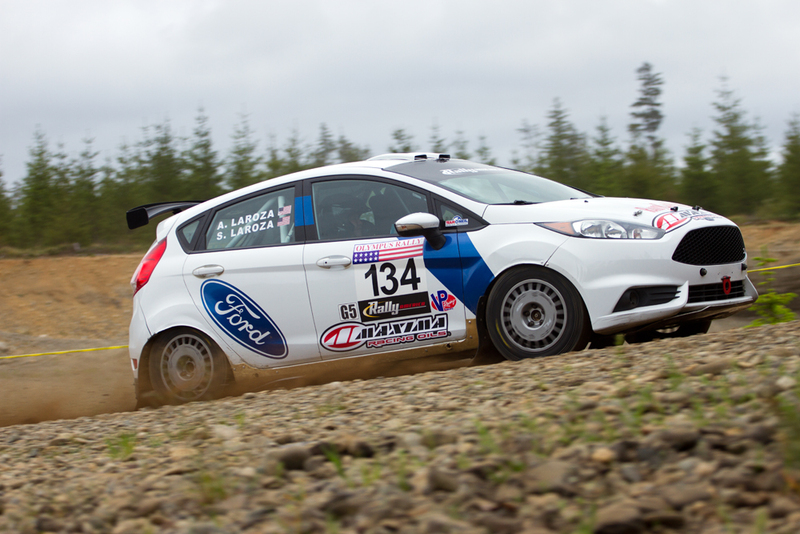 In contrast, Williams is a new face to Rally America competition with only two events to his credit. The pair will be a wild card at LSPR. Williams’ lack of experience in the co-driver’s chair would normally be a concern, but in this case it is more than offset by O’Neill’s skill behind the wheel. This will be the car to follow in 2WD and we can’t wait to see where the rally legend finishes. Countering the disadvantages of the near-production B-Spec Honda Fit with talent and experience, James Robinson and Brian Penza routinely vie for the 2WD class podium. The pair have stood on that podium at every event they entered this year with one exception, the incredibly stacked NEFR. Robinson and Penza normally drive a clean and consistent rally and rarely experience mechanical troubles. The pair are masters of momentum driving, typically matching the pace of much faster turbocharged cars in 2WD despite the power disadvantage of the naturally aspirated Honda Fit. At Ojibwe, Robinson secured his third B-Spec class championship along with his fifth 2WD podium of the 2015 season. The Honda factory team will come into LSPR with nothing but confidence in a strong close to a nearly perfect season. The perennial “other” B-Spec car finishes a rally more often than not, but often lacks the speed necessary to be a threat in 2WD. Driver Tracey Gardiner has spent the 2015 season looking to change that. The addition of Tracy Manspeaker to the Yaris’ co-driver chair at this year’s Olympus rally proved to be an immediate improvement. The Trac(e)ys followed their Olympus performance up with a strong showing at NEFR. The pair finished 15 minutes behind the B-Spec juggernaut of James Robinson and Brian Penza, more than halving the gap from earlier in the season. Gardiner and Manspeaker will be looking to shave even more time off of their gap to the B-Spec Fit, but they will have one main obstacle to overcome. The pair have not driven together in the three months since NEFR and may need a few stages to get back into rhythm.